Lasers have been classified by wavelength and maximum output power into four classes and a few subclasses since the early 1970s. 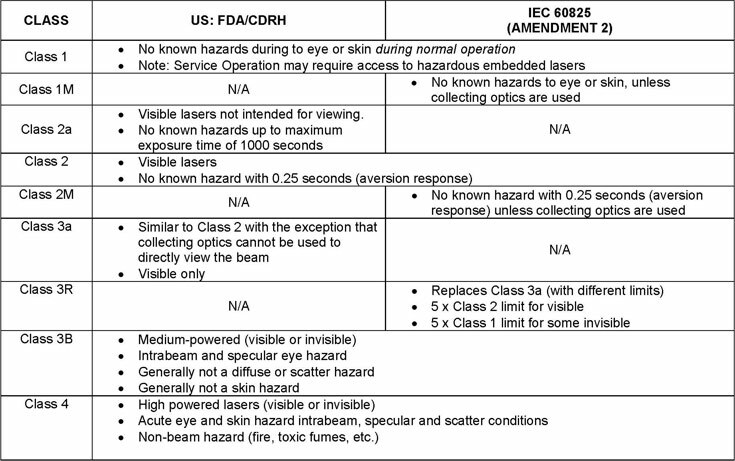 The classifications categorize lasers according to their ability to produce damage in exposed people, from class 1 (no hazard during normal use) to class 4 (severe hazard for eyes and skin). The classification of a laser is based on the concept of accessible emission limits (AEL) that are defined for each laser class. This is usually a maximum power (in W) or energy (in J) that can be emitted in a specified wavelength range and exposure time. For infrared wavelengths above 4 μm, it is specified as a maximum power density (in W/m2). It is the responsibility of the manufacturer to provide the correct classification of a laser, and to equip the laser with appropriate warning labels and safety measures as prescribed by the regulations. Safety measures used with the more powerful lasers include key-controlled operation, warning lights to indicate laser light emission, a beam stop or attenuator, and an electrical contact that the user can connect to an emergency stop or interlock. There are two classification systems in use, one based on the FDA laser regulations in existence prior to 2002, and one based on the international standard IEC 60825. At present the IEC 60825 laser classification system is not fully harmonized with US laser regulation, although products labeled with the IEC 60825 derived system are accepted. Since the laser devices manufactured by Erchonia are used world-wide each device is labeled under both the original US laser classification system and the IEC 60825 classification system. Below is a comparison chart depicting the classifications and the regulations that are associated with each. Following the chart is a more detailed description of each classification. Class 1 — A class 1 laser is safe under all conditions of normal use. This means the maximum permissible exposure (MPE) cannot be exceeded. This class includes high-power lasers within an enclosure that prevents exposure to the radiation and that cannot be opened without shutting down the laser. For example, a continuous laser at 600 nm can emit up to 0.39 mW, but for shorter wavelengths, the maximum emission is lower because of the potential of those wavelengths to generate photochemical damage. The maximum emission is also related to the pulse duration in the case of pulsed lasers and the degree of spatial coherence. Class 1M — A Class 1M laser is safe for all conditions of use except when passed through magnifying optics such as microscopes and telescopes. Class 1M lasers produce large-diameter beams, or beams that are divergent. The MPE for a Class 1M laser cannot normally be exceeded unless focusing or imaging optics are used to narrow the beam. If the beam is refocused, the hazard of Class 1M lasers may be increased and the product class may be changed. A laser can be classified as Class 1M if the total output power is below class 3B but the power that can pass through the pupil of the eye is within Class 1. Class 2 — A Class 2 laser is safe because the blink reflex will limit the exposure to no more than 0.25 seconds. It only applies to visible-light lasers (400–700 nm). Class-2 lasers are limited to 1 mW continuous wave, or more if the emission time is less than 0.25 seconds or if the light is not spatially coherent. Intentional suppression of the blink reflex could lead to eye injury. Many laser pointers are class 2. Class 2M — A Class 2M laser is safe because of the blink reflex if not viewed through optical instruments. As with class 1M, this applies to laser beams with a large diameter or large divergence, for which the amount of light passing through the pupil cannot exceed the limits for class 2. Class 3R — A Class 3R laser is considered safe if handled carefully, with restricted beam viewing. With a class 3R laser, the MPE can be exceeded, but with a low risk of injury. Visible continuous lasers in Class 3R are limited to 5 mW. For other wavelengths and for pulsed lasers, other limits apply. Class 3B — A Class 3B laser is hazardous if the eye is exposed directly, but diffuse reflections such as from paper or other matte surfaces are not harmful. Continuous lasers in the wavelength range from 315 nm to far infrared are limited to 0.5 W. For pulsed lasers between 400 and 700 nm, the limit is 30 mJ. Other limits apply to other wavelengths and to ultrashort pulsed lasers. Protective eyewear is typically required where direct viewing of a class 3B laser beam may occur. Class-3B lasers must be equipped with a key switch and a safety interlock. Class 4 — Class 4 lasers include all lasers with beam power greater than class 3B. By definition, a class-4 laser can burn the skin, in addition to potentially devastating and permanent eye damage as a result of direct or diffuse beam viewing. These lasers may ignite combustible materials, and thus may represent a fire risk. Class 4 lasers must be equipped with a key switch and a safety interlock. Many industrial, scientific, military, and medical lasers are in this category. This classification system is only slightly altered from the original system developed in the early 1970s. It is still used by US laser product safety regulations. The laser powers mentioned are typical values. Classification is also dependent on the wavelength and on whether the laser is pulsed or continuous. Class I — Inherently safe; no possibility of eye damage. This can be either because of a low output power (in which case eye damage is impossible even after hours of exposure), or due to an enclosure preventing user access to the laser beam during normal operation, such as in CD players or laser printers. Class II — The blink reflex of the human eye (aversion response) will prevent eye damage, unless the person deliberately stares into the beam for an extended period. Output power may be up to 1 mW. This class includes only lasers that emit visible light. Some laser pointers are in this category. Class IIa — A region in the low-power end of Class II where the laser requires in excess of 1000 seconds of continuous viewing to produce a burn to the retina. Supermarket laser scanners are in this subclass. Class IIIa — Lasers in this class are mostly dangerous in combination with optical instruments which change the beam diameter or power density. Output power does not exceed 5 mW. Beam power density may not exceed 2.5 mW/square cm. Many laser sights for firearms and laser pointers are in this category. Class IIIb — Lasers in this class may cause damage if the beam enters the eye directly. This generally applies to lasers powered from 5–500 mW. Lasers in this category can cause permanent eye damage with exposures of 1/100th of a second or less depending on the strength of the laser. A diffuse reflection is generally not hazardous but specular reflections can be just as dangerous as direct exposures. Protective eyewear is recommended when direct beam viewing of Class IIIb lasers may occur. Lasers at the high power end of this class may also present a fire hazard and can lightly burn skin. Class IV — Lasers in this class have output powers of more than 500 mW in the beam and may cause severe, permanent damage to eye or skin without being magnified by optics of eye or instrumentation. Diffuse reflections of the laser beam can be hazardous to skin or eye within the Nominal Hazard Zone. Many industrial, scientific, military, and medical lasers are in this category.